Two of the all-time greatest anime legends collide in one epic saga! 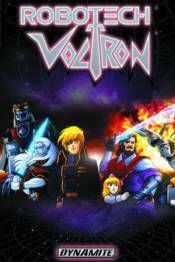 The Lion Force team faces the return of a mysterious, ancient adversary that could jeopardize the very existence of Voltron itself. The repercussions threaten to reach across the fabric of time and space, all the way to Earth. How will Roy Fokker and the Skull Squadron cope with such a new menace, especially with the Zentraedi looming over Macross Island? What dark opportunities will Lotor, the would-be conqueror of planet Arus, pursue in a crisis like this?